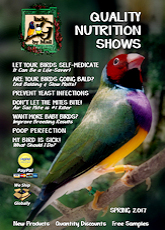 ladygouldianfinch.com - Cage or Aviary? ..which is best for you? Which is really best for finches? Unlike parrots which we let roam free around the house and buy large play gyms, finches spend their whole lives in a cage. We all want our birds to be happy in their home but which cage is best for your finch. Maybe an aviary would be better? Cages: When people ask me which cage would work best for their finch, the first thing I have to ask is "which species of finch do you have?". Generally people buy the wrong cage when they first buy a finch, simply because they don't know enough about their finch. The general fault in finch cages today is their size. Many are simply too small. Finches need to fly. Working the flight muscles keeps the birds active, strong, and healthy. Horizontal flight is good, but that is mostly a jump and glide to the next perch. Vertical flight requires more effort. The actual size of the cage needed will depend greatly on the species of finch you want to house. Some species of finch are larger than others, some are more active than others. Most finches found in pet shops are good cage birds. When in doubt, a larger cage is better. Please watch the bar spacing on larger cages.You don't want a finch to fly right out or get its head stuck in between the bars. Zebra, Society, Orange Cheek Cordon Bleus and Gouldians are all active birds but are bred in cages and therefore will be quite happy in a modest sized cage. They can live out their lives and even breed in a cage as long as they feel comfortable in their environment. Java Rice, Tri-Color Nuns and Spice are slightly larger birds which may need a little more space. Most Waxbills and Whydahs will not enjoy the confinement of a cage unless it's very spacious because they are very active little birds. Weavers on the other hand need lots of space because they tend to be aggressive. Of course, having the right size cage doesn't do any good if it's filled with perches, swings, and toys. I've seen cages so cluttered with stuff that the poor finch couldn't even open its wings for fear of hitting something. Cage accessories are nice since finches do like a little variety in their home. But take care not to crowd the bird out. What are cages good for? They are great for breeding. Keeping the breeding pair away from other pairs guarantees they will not breed with any other finch. Many people, like myself, who breed finches for show and sale keep breeding pairs in smaller flight or breeding cages. This is to ensure that the parent birds don't mate with any other bird, and that there is no competition for the food and water. 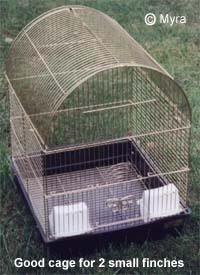 Cages are also best used for people who keep a few finches, or a variety of species that don't mix well in an aviary setting. The majority of finch owners don't breed their birds. They simply want to enjoy their company. Household environment will have a big impact on your finch. Location of the finches cage is very important. Keeping a finch cage in the kitchen is rarely a good idea. Fumes from non-stick cookware, self-cleaning equipment and aerosol sprays can kill any species of bird very quickly. Areas in the house with high human traffic can also pose a problem, especially for the more flighty species. The finches cage should be kept back from doors and walkways. Allow space between the cage and where people walk by. Aviaries: Aviaries are becoming very popular in homes and businesses. Over the last few years many nursing and retirement home have installed aviaries in their facilities. For the most part these aviaries are small and only house a handful of finches but they are so beautiful you can't walk by without stopping to admire the aviary and the birds within. These indoor aviaries are often built out of wood and plexiglass. They provide excellent viewing of the birds and don't allow much mess to get out. Because of the health issues with the elderly the finches environment must be as self contained as possible. Aviary manufactures have done a great job building these specialty aviaries. Many of them are available to the general public, but they are not cheap. For people who can not afford to buy some of these fancy indoor aviaries, they must build their own. Materials and design vary from person to person. The one thing I enjoy about home built aviaries is their uniqueness. The internet is filled with images and stories about people and their home built aviaries. Some of these people have invented unusual ways of building and maintaining them. The majority are built to be functional, easy to clean and keep, but some turn into little birdie amusement parks, with complex series of perches, swings, ladders and toys. 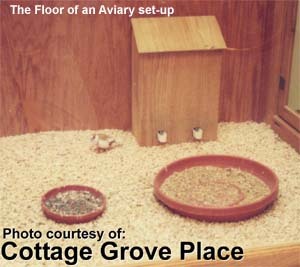 The "Backyard" aviary is almost common place in the warmer states. The neat thing about most backyard aviaries, like the home built indoor aviaries is that they are all different. 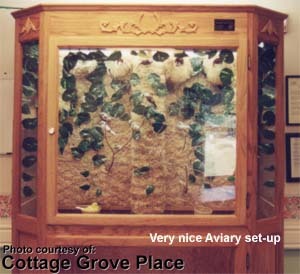 Everyone builds their aviary to suit their needs and their backyard landscape. 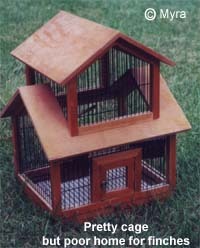 The backyard aviary is relatively inexpensive to build, you can make them as simple or complex as you like. Outdoor aviaries should not be used anywhere the temperature drops into the 30s or below for any length of time. Most finches originate from very warm and tropical climates. Because of their size, most aviaries can hold many finches and a larger variety than a cage can. Many species of finch will happily live in the same aviary together providing there is room enough for them to get away from each other. Other species will simply not do well in a mixed aviary. After introducing new birds to an aviary you must watch for signs of aggression. You must never house any hookbill species in an aviary with finches. You should never house any hookbill species with any finch or softbill species. Hookbills tend to cause serious bodily harm to finches. 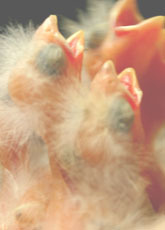 The finches become play things in the eyes of the hookbills, and can be quickly torn apart. I've encountered far to many bloody messes when visiting aviaries that have made this mistake. Aviaries do take up quite a bit of space, whether in your house or yard. They can be difficult to keep clean and with larger numbers of finches living in them the food and water will be soiled quickly. Every aviary has a different approach to the messy problem. You should take time to consider the cost and maintenance requirements of an aviary before you buy or build one. Personally I have found that hanging wild bird feeders are great for holding and dispensing seed. Water can be placed in shallow bowls or run through the aviary in a series of falls and streams for the larger aviaries. Outdoor aviaries don't usually need to worry about the floor getting soiled, nature will take care of that. Indoor aviaries require regular washings or mopping to removed excess droppings. 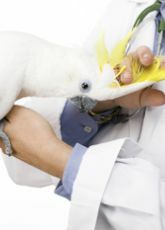 Keeping the aviary clean will help ensure your birds stay happy and healthy. 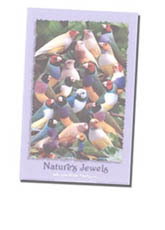 In the past several years I have noticed changes in my finches living and breeding in the indoor aviary. My finches have become more social, stronger, and overall more active. The offspring also seem to be more healthy and friendly with other species on average than my cage bred finches. Conclusion: Which you ultimately choose is up to you. Common finch species, like those found in pet stores and bird fairs are bred for cage life. Given enough space, food, water, light and companionship your finch will be happy and healthy.